How does standard Apple CarPlay sound? One look at the 2019 Toyota C-HR and it’s clear we can no longer say the automaker lacks emotional design. This sub-compact crossover’s styling may not be for everyone but its strong sales clarify Toyota made the right call. And now the automaker has announced some upgrades for the 2019 C-HR that will make it even more appealing. For starters, Apple CarPlay compatibility is now standard, as is an eight-inch touchscreen. Toyota has also modified the trims levels, which now include LE, XLE, and Limited. XLE Premium has been dropped. The base LE trim comes standard with 17-inch steel wheels and LED daytime running lights with halogen headlamps. 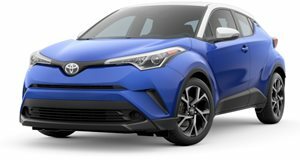 Bump up to the mid-range XLE and you get standard features including blind spot monitoring with rear cross traffic alert, "Toyota C-HR” puddle lamps, piano black upper console, and push-button start. Buyers can also tack on Entune 3.0 Audio Plus for an additional cost. The top trim Limited has standard fog lamps, piano black B-pillar, rain-sensing wipers, heated front seats, chrome window trim, and optional Entune 3.0 Premium Audio. Entune 3.0 Audio Plus is already included. Although these are all relatively minor changes for the new model year, it’s a clear-cut sign Toyota is paying close attention to what customers want. It was a no-brainer to make Apple CarPlay, for example, standard fare for all trims because consumers, especially the C-HR’s young target audience, put an especially strong emphasis on connectivity features. Furthermore, competing brands, namely Hyundai and Kia, have already made Apple CarPlay (and Android Auto) standard in many of their models. Toyota simply had to follow suit. Toyota sold 49,642 C-HRs in the US last year and 25,755 in 2017 even though it didn’t even go on sale that year until March. January and February 2019 sales were higher than last year during those months. Those figures may sound impressive but the RAV4, by comparison, has been far more successful. Last year alone 427,168 units were sold in the US. Toyota is hoping the slight changes made to the C-HR will help boost sales. Toyota also confirmed a 2019 base price of $20,995. Don't say Toyota cars are boring anymore.